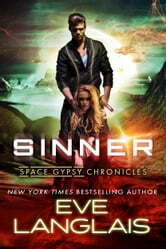 Sinner by Eve Langlais 2nd in the Space Gypsy Chrnicles. Definitely read the first before reading this one. The adventure draws the reader in immediately. No spoilers. A surprise in store. Loved the arrogance of the main character. He is awesome and will be the first to tell you. And the computer that has a thing for her commander is hysterical.